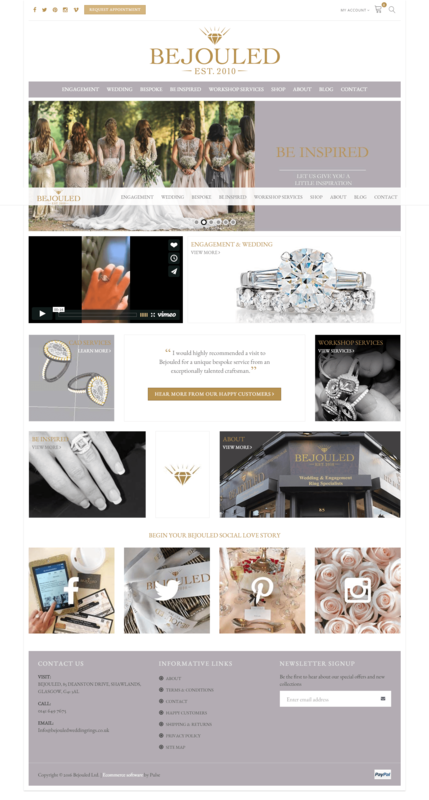 Bejouled is a renowned brand in jewellery that sells wedding rings, bridal sets, engagement rings, solitaire, halo, cluster and lots more. 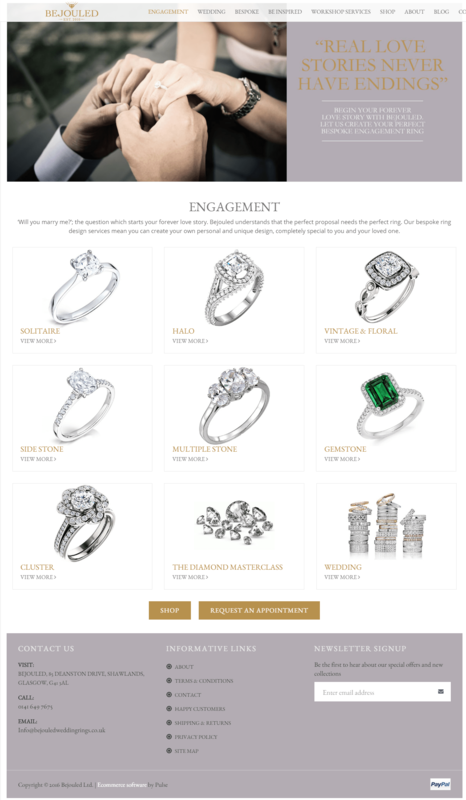 They have been providing the to-be-weds with their forever jewellery for over 25 years and offer bespoke services apart from the unique designs and expertly crafted pieces of jewellery. Ecommerce development to add the new features for selling online. Responsive design so that it’s convenient for the mobile users as well. The website should render well on mobile devices of all sizes. E-commerce admin panel to ensure that the client could make edits and add or remove product conveniently without too much technical help. After analyzing the customer requirements, our team at Pulse Solutions proposed to use WordPress so that the client gets a CMS based website that can be easily edited. Woocommerce was used to integrate e-commerce features. The site was also made responsive so that mobile users could conveniently access it from their smartphones. Completely revamped the website to give it a new look. WordPress was used so that client could add or edit the content conveniently. Woocommerce was used to enable online shopping features that could drive more sales. MySQL was used for the database purposes. Product management was made easier due to the addition of CMS pages for content modification. The site was made responsive and was easy to navigate via phone or desktop. Easy navigation was created for customer online ordering process, to request an appointment and for showcasing products online. Features were added to make the website more SEO friendly. As a result of the new web design and features developed by Pulse Solutions, the client noticed a significant difference in their business. 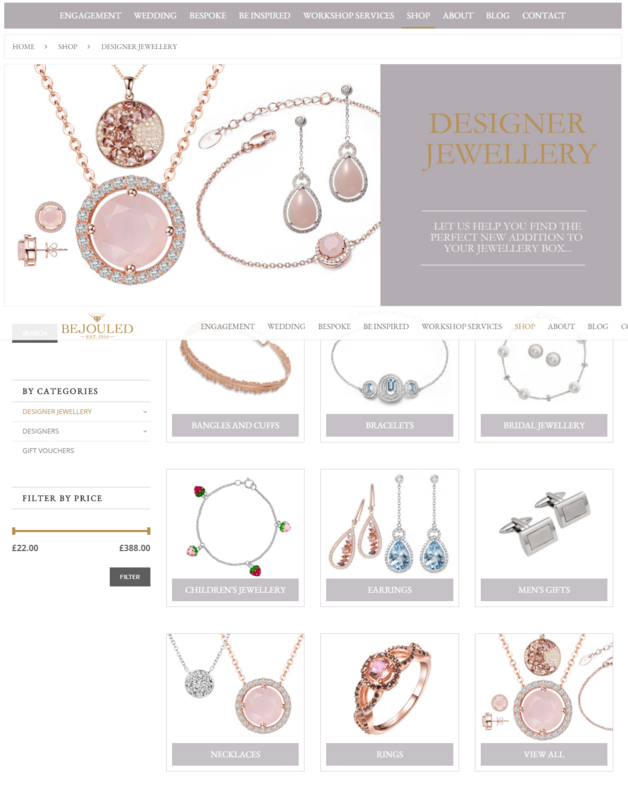 Customers could conveniently place orders online for their jewellery. The introduction of e-commerce features for the website also had a positive impact on the sales. The SEO friendly features ensured that they get measurable results for their online efforts. The website was made responsive. The project was completed within a short span of 2 – 3 months. If you are looking at a revamp of your existing website or wish to build a new website for your business with all the latest features and trends, let’s talk about how we can do it together. Contact us today.